The special election that will need to occur fill State Senator Balboni (R) is an opportunity for the Democrats to pick up another seat in the Republican controlled Senate. Senate Majority Leader Joseph Bruno, R-Brunswick, called a press conference this evening to confirm he is being investigated by the FBI, which has launched an inquiry into his business dealings through his consulting company, Capital Business Consultants. It's not yet clear, though, what the FBI is investigating. Yet. The senator refused to discuss what, exactly, the FBI is looking into. He declined to say whether it has anything to do with Evident Technologies Inc. - the company to which he steered $500,000 via two state grants with no strings attached. Bruno has personal ties to several of Evident's directors, Jared Abbruzzese, one of the company's founders and a former co-chair, and Wayne Barr - both of whom share the senator's interest in horse racing.Abbruzzese is being investigated by the state Lobbying Commission for providing his plane to Bruno for several trips, including a fund-raiser and a tour of several Kentucky horse farms that Barr arranged.One thing you should disregard, though, is Bruno's claim that he is "not a target" of the investigation. Here's why:[Washington attorney Stanley M.] Brand said that distinctions in a federal criminal manual between a "target," someone the Justice Department has decided to seek charges against, and a "subject," someone under investigation who could be upgraded to a target, are largely meaningless in a practical sense. "You can't take these distinctions to the bank, because the Justice Department can change your status whenever it wants to," Brand said. Brand was talking about Conrad Burns, and you can see how well that bit of verbal legerdemain worked out for old Burnsie. Same, too, with Bob Ney, who claimed he wasn't a "target" almost until he was indicted. He's now going to be sentenced to prison next month. This story also gives me an opportunity to do something long overdue, which is to tell you about a new SoapBlox blog that's opened up shop right in my political neighborhood. The Albany Project is dedicated to shining a much-needed light on corrupt, obscurantist the New York state legislative apparatus (ranked as the worst out of all 50 by the Brennan Center). The site's already been following this story closely, and it'll be the place to go for continuous coverage of this potentially explosive news. Scheduled candidate’s events and set the candidate’s priorities. Wrote and executed field plan. Was the liaison to labor and political organizations, wrote press releases for local media. Hired, trained and managed paid petitioners. Recruited and managed volunteers and interns. Hired, trained, and managed 10 paid canvassers/petitioners. Recruited volunteers from personal interactions with the candidate. Wrote the field plan, with 200,000 targeted primary voters and executed the plan. Mobilized Florida PIRG members to write letters to local media and to their Representatives & Senators in Congress as well as to attend rallies regarding the energy bill. Organize media events in the Tampa area. Hired, trained and supervised a staff of 20 paid canvassers to contact voters in 6 counties of the eastern exurbs of Columbus, OH. Ensured all employees and volunteers were in compliance with FEC rulings of a 527 non-profit organization. Responsible for the office's spending and budget. Acted as campaign manager, treasurer and field director for campaign of at-large town council seat of town of 33,000 people. Knocked on over 3,500 doors, and had direct contact with 1000 voters. Executed final details of national television ad time with Network and Syndicator Sales department. Collected and organized petitions for a state -wide Attorney General election. Shared supervision over thirty paid petitioners. Maintained a database of constituents. Special Training 21st Century Democratic Field Campaign Training: Intensive training focused on the essentials of running a field campaign including; volunteer recruitment, earned media event planning, analysis of voter files, and letter-to-the-editor campaigning, as well as budgeting time, money, people & other resources. I had a very boring ballot this morning. Spitzer, Clinton, Cuomo, Ackerman(no opposition), Sabini(no opposition), Peralta(no opposition). Comptroller was the only interesting position I could have voted for and being aware of the Saratoga County Government there was not a snowball chance in hell would I vote Chris Callahan. The question was Hevesi or Green party candidate as a protest vote. I guess the judges were also necessary votes, but still voting without any real excitement. Remember to go out and vote. The listing of my representatives produces a very unique overlap and one could probably figure out exactly where I live from it. In the 24th State Senate District Mathew Titone beating Citycouncilman Lanza for Senator Marchi's open seat. In the 47th State Senate District John Murad winning the district that Ray Meier is vacating in his run for congress (which he is losing by the account of the public polls and non-partisan Congressional Quarterly's opinion). In the 11th State Senate District Nora Marino has 3 to 1 Democrats for every Republican registered in her district as she runs against Padavan. I am sure I've missed a couple of other susceptible districts. The Democrats only need four more seats to win control of the State Senate, and I am sure the next election after the Democrats take control of the senate you will see about a dozen Republican State Senators will retire because they will not want to be in the minority. The Democratic takeover of the state senate will certainly be before the redistricting for the 2012 election which will cause a critical mass of seats change hands to the Democrats. After the 2012 elections the State Seante could very well have 43 seats and look like the state assembly today with veto proof majority. Rep. Sweeney today came out and announced that he "loves his wife and loves his children." The congressman did this in response to the likelihood that he actually beat his wife and that the state troopers came to his house Dec 2, 2005 in response to his wife's call to 911. His children are from his first marriage that ended in divorce in 1998 the wife that he alleged beat up in 2005 is Gaia Sweeney whom the congressman married a couple of years ago. In the years in between the two marriages John Sweeney had long-term sexual relationship with his district office manager and Member of Saratoga County Board of Supervisor Anita Daly. It did not stop John Sweeney to pursue a relationship with Mrs. Daly even though she was still married. The Congressman's opposition to gay marriage while destroying his and other's marriages is one of many examples of the hypocrisy that John Sweeney is drowning in. Posted on TU.com this evening: an article by Brendan Lyons, with work by Elizabeth Benjamin, detailing a domestic incident call last December at the residence of U.S. Rep. John Sweeney. Sweeney’s wife, Gaia, called 911 to say her husband was “knocking her around the house” and hung up, according to a report on the Dec. 2 incident. Sweeney told a dispatcher who called back that there was no problem, and his wife got on to say she was fine, and drunk, the report states. Police went anyway, which is standard procedure. Gaia Sweeney told the officer they’d had a “verbal arguement that turned a little physical by her being grabbed around the neck and pushed around the house.” The Congressman had scratches on his face, according to the report, and his wife spent the night at a friend’s. State Police refused for months to release the report, which we finally obtained last week and authenticated by multiple sources. The Sweeney campaign branded it “unauthentic, false and concocted.” The campaign would not address its substance, however. The proposal has also been championed by City Council Members Michael E. McMahon and Joseph P. Addabbo Jr. as well as the Patrolmen's Benevolent Association. The Bloomberg administration, however, has traditionally opposed legislation that would add to the city's already burgeoning pension and labor costs. "It's a very small sum in the scheme of things to protect this city," Mr. Lancman countered. "We are not talking about more than a couple of thousand city workers. It's not going to be more than a few million dollars." State statute requires every locality to continue to pay up to 30 days a year to workers who perform ordinary National Guard and Reserve military service. After Sept. 11, 2001, that period was extended to 60 days for employees called up in connection with the terrorist attacks. The state Department of Civil Service provides differential pay for state workers called to duty, who must choose between receiving their military or state salaries. The state determines the employee's total military pay, which includes a housing and food allowance, and then adjusts and supplements the worker's periodic paycheck so that the combined pay equals their normal civilian salary. City workers, however, are required to repay the lesser of the two salaries upon returning from military service. The Department of Citywide Administrative Services has also asked that the workers repay military housing, food, and hazardous duty allowances. "The way the city is calculating how much these guys owe is based on gross pay as opposed to net pay," Mr. Lancman added. "The city is actually asking them to pay back more than they receive. That's ridiculous." Kristen Zach, Councilman McMahon's Deputy Chief of Staff, said that her Police Officer husband returned from a year of military service in 2002 but only recently received a letter from DCAS asking for the money to be returned. "It was a huge surprise," she remarked, noting that they owe $37,000 according to the city's calculations. "Now we have to figure out what to do. A lot of people were lulled into a false sense of hope." Most officers initially saved the extra wages but then spent the money, she said. "Because there was no word for four years, people didn't really expect they were going to have to pay back," she commented. "Other cities such as Philly and Los Angeles have cancelled the debt." Most of the officers, she continued, aren't expecting the Bloomberg administration to erase the debt. "Nobody is saying we shouldn't have to pay anything back," she added. "It's just not reasonable the way the city is calculating payments." Council Member McMahon has drafted a resolution urging the Bloomberg administration to change the way the city has estimated what employees owe. "It's a way to encourage the Mayor to do the right thing," Ms. Zach said. A mayoral spokesman declined to comment on the proposal, noting that it has not yet been drafted. According to an internal DCAS memo, there have been 1,624 city workers called to active duty since Sept. 11, 2001. The departments most affected and the numbers of reservists in each are: Police Department, 988; Fire Department, 172; Correction Department, 149; Sanitation Department, 65; and Human Resources Administration, 34. Agencies have established their repayment plans differently, the document noted. For instance, the Sanitation Department has been notifying employees of their obligation to pay back the money shortly after the workers return from service. The NYPD, however, has only recently begun sending letters to members telling them about the amounts that they owe, the memo acknowledged. "The first letters went to approximately 100 individuals who returned from military duty from 2001 through September 2002," the DCAS document noted. "The NYPD expects to issue letters at a later point to those individuals who returned from leave in more recent years." Because of the delay, many of the officers have already retired, Mr. Lancman pointed out. Those officers have been ordered to pay the money in full within 30 days. In contrast, current employees are required to give no more than 10 percent of their biweekly civilian salary towards repayment. "When they came back, the city was going to let it slide," the Assembly candidate asserted. "You can't retire, because the day you retire you are going to owe the whole thing." The DCAS memo also noted the negative media attention the issue had been attracting since the notification letters were mailed. DCAS Director of Communications Mark Daly advised city officials that the matter "appeared in at least two news reports and was the subject of a call to the Mayor's radio show." Mr. Addabbo, who chairs the Civil Service and Labor Committee, said that he will hold a hearing on the matter in early fall. "The issue has to be paid attention to," he remarked in an Aug. 15 phone interview. "So many of our city workers are being hit with a severe financial burden." Mr. Lancman's broader proposal is in its nascent stages. He is pitted against Morshed Alam, who is running as a Democrat and a Republican, in the Sept. 12 primary election. Mr. Alam is also a member of District Council 37's Civil Service Technical Guild Local 375.
that of the United Federation of Teachers and the DC 37 Retirees' Association. August 21, 2006 -- A nonprofit run by an Assembly candidate out of his Queens home cancelled its city contract for immigration and youth services after officials paid a surprise visit and found "no discernable attendance," The Post has learned. The American Bangladesh Friendship Association notified the city's Department of Youth and Community Development that it had decided on Jan. 25 to halt a $16,000 contract begun on July 1, 2005, for immigration referral and youth services. Two days earlier, at 7 p.m., two DYCD officials made an unannounced visit to the program, located in the basement of a private house at 169-08 Grand Central Parkway. "The visit noted no discernable attendance and/or registration records," Timothy Johnson, DYCD's director of discretionary contracts, wrote in a Feb. 1 memo. The executive director of American Bangladesh Friendship Association at the time was Morshed Alam, who is running for the Assembly seat vacated by Brian McLaughlin, the labor leader under investigation for allegedly helping rig a city electrical contract. Alam told The Post that his group has since disbanded because "a lot of people have moved from the neighborhood" and attendance at its programs had diminished. The city paid the organization $10,000 of the $16,000 due on the contract - including $4,200 in rent to Alam and his wife, the property owners, between July 1, 2005 and Jan. 31, 2006. "That was a misunderstanding," said Alam. "We didn't realize it was a conflict. That was a place we were using for a long, long time. When we had the contract, they didn't say anything." Last week, Alam said, DYCD officials notified him he would have to return the rent payments. The funny (sad?) part about Alam's rally, as the Tribune reported, is that he tried to pretend it was staged by a non-political and heretofore unknown group, "The Immigrant Coalition For Democracy" (headed by, you guessed it, Alam's campaign manager), except that someone forgot to tell Alam that when you fax a press release from your campaign office, it prints out of the recipient's fax machine with the sender's identity printed on top (you guessed it again: "Alam4Assembly"). D'OH! It's been a tough week for Republicrat Morshed Alam, who is Democrat Rory Lancman's opponent for the open 25th District State Assembly seat in Queens. First, he got caught using a non-union printer for his lit and posters, even though the lit in question touts his being a DC37 member and claims he "Supports labor's right to organize and for their members to be treated with dignity and respect." I guess that doesn't apply to workers in the printing trade. Then the New York Observer caught him fabricating endorsements. The reporter's conversation with Councilman Leroy Comrie is particularly funny ("He's been calling me and begging me and calling me and asking me and calling me and asking me."). Then the Queens Tribune outed Alam as also running on the Republican line (understandably, Alam was "reluctant" to discuss his Republican endorsement). And finally Alam's campaign finance filing showed him with barely $14,000 on hand. (Rory Lancman filed with over $78,000 on hand). Like I said, it's been a tough week for Morshed. Rory, on the other hand, had another great week, with UNITE HERE adding its name to the formidable list of unions already backing Rory, including 32BJ, RWDSU, CSEA, DC37 Retirees, DC37 Local 983, UFCW Local 1500, Carpenters Local 45, Mason Tenders, Painters DC9, SEIU Local 74, CWA 1180, 1106 & 1102 (and, of course, the Working Families Party). Candidate for Queens 25th Assembly District, has less than impressive financial filing ($14,000 on hand), has yet to receive the endorsement of his home union Local 375, filed petitions to run in both Democratic and Republican primaries, campaign literture have routinely had typos and misspellings: such as an endorsement of City Councilman Leroy Comric (he spelt it Comrie). To top it all off The Politicker has reported that one of the few endorsements he claims to have received, hasn't endorsed him. So why did this guy say you did? "We served on the school board together. He's been calling me and begging me and calling me and asking me and calling me and asking me. I told him I'd try. But I was in the middle of budget process and wasn't thinking about anything else." So a bunch Union students are just hanging around when what appears to be a super-duper senior on the 15 year degree plan shows up to party with them at their frat house. From all witnesses account of the activities Congressman Sweeney was slurring his speach and generally acting drunk. Hopefully he fired whichever staffer that let him go to the party. There are very few interesting races in NYC, with Bloomberg pulling back his blackmail of backing Dem challengers to three Republican State Senators (Maltese, Padavan, Goldin) since he finally got the CFE money from the state. This is an open seat in Eastern Queens with Brian McLaughlin not running for re-election and long time community leader Rory Lancman heir-apparent to the seat. Les Roberts and Mike Arcuri are the two most likely next Representatives from the 24th district who ever wins the September 12th Primary. Rep. Boehlart called itquits this past Friday. Democrats really have a good chnace picking up this seat. Just another sign that it is the Democratic party that can better manage tax payers dollars than the GOP (the credit card millionaires of public policy). For the last 12 years Republicans have operated 2/3rds of the state government which has lead to $49 billion budget deficit this coming fiscal year. This parallel to the National Republican party other State’s Republican can be seen in the amazing amount of debt in Republican controlled governments. On the other hand Democrats like Mark Warner in Virginia and Tom Suozi in Nassau County (not an endorsement, haven’t decided who I’m going to vote for NY Governor yet) show that they can quickly overcome decades of Republican mismanagement. Bush’s 2001 tax cut that came along with a “Tax refund” on 2000 taxes which was simply a advance like any payday loan charged with interest. When will Americans realize that every day we live with public debt it means that working people have to pay taxes on interest and receive less government service, while the wealthiest of the planet profit without any effort or labor of their own? Let oversimplify this W’s Grandfather (Prescott Bush) was born into such extreme wealth that he could live off the interest of his wealth it benefits the whole Bush family and every generation of silver spooned trust fund baby that the longer the national debt running more than $8 trillion the more money they make. Though the uber-wealthy of America do not hold a majority of the debt and since they profit and have the most influence to American policy I’m willing to tag them with the most accountable. State Senator Marchi has held his seat for nearly 50 years, even though it is a seat in the capital of liberalism New York City State Sen. Marchi is considered an institution in Staten Island and my prayers for a quick recovery for the State Senator are with him this lenten season. Pataki on the other hand was expected to leave the hospital over a week ago and has been under the knife in two different counties (Westchester and New York). Could there be a real shake up in the GOP governor's race? Could George resign due to health reasons? Mary Donahue probably would run if she is running as the incumbent governor and may have Stephen Minarik clear the way since he so disdains primaries (and probably disdains general elections as well). Both politicians have appearence of leadership among; Sweeney led the Brooks Brother Riot in Florida as part the 2000 recount debacle; Pataki has presidential aspirations and cut-throat ambitions that attracted D'Amato's attention back in 1992 after taking out a GOP incumbent State Senator. With the loss and/or deterioration of either Sweeney or Pataki's capabilities draws the New York State GOP bench of talent to next to nothing. If you live in one of the following Districts remember to go vote. * Member of the Senate in the 60th Senatorial District, in the Counties of Erie and Niagara, caused by the resignation of the Honorable Byron W. Brown. Congressman Boehlert of the 24th has sluggish fundrainsing, term limited chairmanship on the Science committee, and Don Young of Alaska promising he would do anything possible to ensure that Boelhert does not become the Chairman of the Transportation Committee (which Young now chairs and is also term limited), all of which give him little reason to stay in the job for a 13th term. So if Boehlert does step down who in the GOP steps up? Brad Jones is already running, though will force any other Republican to spend more money in the primary he would lose in the general due to how exuberantly conservative he is (he has been heard bragging that he is "10 times more conservative than Bohlert could ever be") and how moderate the district is. There are two state Senators that have mumbled about throwing their hats in the ring State Sen. Ray Meier and State Sen. James Seward. Seward has been linked with Walter Rich scandal and his infamous Cooperstown fundraisers, but may still forge forward leaving two open state senate seats. Any open senate seat while the Spitzer/Clinton Tidal wave occurs is takable seat, along with Spano's seat in Westchester (which is poachable since he won it by 125 votes two years ago) brings the Dems to a tie in the state senate. Can New York become entirely represented by Democrats? Boelhert(24th district), Jim Walsh(25th district), Sweeney(20th district) , John Mchugh (23rd district), Randy Kahl (29th district) are all susciptible to losing with a tidal wave of Democratic votes from Spitzer/Clinton, the contiuance of the culture of conservatives' corruption in DC, they all have strong Democratic chalengers declared and raising money. Tom Reynolds (26th district), Vito Fosella (13th district), and Peter King(3rd district) are unlikely to lose their seats, but you never know how wide congressional scandals could reach. The state lobbying commission has asked railroad executive Walter Rich to produce records that show who he wined and dined during the Baseball Hall of Fame induction weekends over the last few years at his Cooperstown mansion. The New York State Temporary Commission on Lobbying asked Rich in the fall to turn over the names of people who stayed at his home, called Edgewater, and in other guest rooms he reserved around the village during the busy baseball weekend. The commission wanted records as detailed as the names of people who got $11 tickets to the Hall of Fame Museum, said Nathan Fenno, spokesman for the NY Susquehanna & Western Railway. David Grandeau, executive director of the lobbying commission, said he cannot comment on pending investigations. He said the commission plans to hold a public meeting Feb. 8. New York state's lobbying laws prohibit a lobbyist or client from offering or giving gifts valued at more than $75 per year, Grandeau said. The commission uses eBay and other methods to put a market value on an item such as an autographed baseball, he said. The state commission regulates the people who lobby state and local government officials, but not the government officials. That is up to the state ethics commissions for each branch of government. The maximum penalty for lobbying violations is $50,000 per violation, he said. For the past two decades, Rich and his wife, Karine, have invited New York's business and political elite to enjoy the induction weekend from their fenced-in lawn, just down the street from the Hall of Fame. Some guests make the mansion their home base for the entire weekend. Others come for just a few hours to attend political fundraisers, staged back-to-back under a tent on the lawn. The baseball players filter in and out of the parties and sign memorabilia. Sometimes the politicians pay the players to attend. Sometimes the players just show up. Last summer, for example, Yogi Berra stopped by at Edgewater on Thursday before the parties really got started, Rich said in a Post-Standard interview in July. 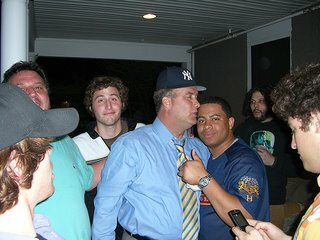 Rich asked the former Yankee to sign a jersey that he gave to Gov. George Pataki during a Republican fundraiser two days later on Edgewater's lawn. State Sen. James Seward, R-Milford, and Rep. Sherwood Boehlert, R-New Hartford, also held fundraisers at Edgewater during the Hall of Fame weekend. Rich's partyguests were the subject of another state investigation in 2004. Attorney General Eliot Spitzer interviewed party guests as part of his investigation into the state's sale of Erie Canal development rights to a Pataki campaign contributor. Richard Hutchens, the Buffalo man who got that contract, made his connections with state canal officials during baseball-themed parties at Edgewater. Three former Canal Corp. officials may have violated state ethics laws when they hit up Hutchens for campaign donations and steered the contract to him, but they could not be prosecuted because they left their jobs, Spitzer said. Rich told Spitzer's investigators that he spends about $100,000 a year on the Hall of Fame weekend. He said in a Post-Standard interview after his 2005 party that he sends an itemized list to the politicians, who must reimburse him for lodging, food and other expenses. Seward spokesmanDuncan Davie said the senator has reimbursed the railroad company for all of its expenses. Election records filed in January for the Friends of Senator Seward show a $12,586 payment to NY Susquehanna & Western Railroad for the 2005 reception and a $6,000 payment for an outstanding bill from 2004. Davie said the senator received a letter Friday from the lobbying commission that asks for information about the events in Cooperstown. He would not elaborate on the information requested, but said the senator will comply. Rich and his railroad companies have reported at least $100,000 in donations to state candidates and committees since 1999, according to records filed at the state board of elections. Rich has retained the firms Ostroff, Hiffa & Assoc. and Marsh & Assoc., records show. Rich has along history of contributing money to politicians and receiving tax money for his railroads, which include OnTrack, the little-used passenger train that shuttles between Carousel Center and Syracuse University. OnTrack has received more than $8 million in state grants. In recent years, the New York Susquehanna & Western was the recipient of a $3 million state grant that Sen. Thomas Libous, R-Binghamton, said would be used to run passenger trains daily between Syracuse and Binghamton. Four years after that announcement, there is no such passenger service. Fenno said the railroad has cooperated with the commission. He said the Riches try to keep within limits for gifts and campaign donations. He said, however, that it is difficult to distinguish between the guests who come to a certain fundraiser and guests who stop in at another point during the weekend. "We certainly don't think we did (go over the limit) and if we did, it was definitely something unintentional," he said. This guy has worked in more war zones than the entire bush administrations. I know that the Bushies are not ones to every put themselves in the line of fire that why Les Roberts needs to be sent to Congress. What does Sen. McCain, Gov. Warner and Angelina Jolie have in common? C-SPAN showed a four person panel about world economics issues last night within their series "Road to the White House 2008." It had Sen. John McCain (AZ-R), former Gov. Mark Warner (VA-D), Sen. John Sununu (NH-R), and David Gergen presidential advisor to Reagan, G.H.W. Bush (41), and Clinton. They panned the crowd and who do we find but Angelina Jolie pensively listening to the discussion. This is all at the Davos, Switzerland World Economic Forum. Last Thursday when John Kerry came back early from the same World Economic Forum, White House Press Secretary Scott McClellan joked and laughed that Kerry came off the slopes to organize a filibuster. Just more proof that if McClellan's lips are moving than he must be lying. Is U.S. Rep. Sherwood Boehlert, R-New Hartford, running for re-election? Based on the amount of money the congressman has raised, the answer might well be "no." Boehlert, 69, will make an announcement in March, his spokesman, Sam Marchio, said Friday. "I think he’ll announce his plans in the third week of March because that’s when Congress will be in recess," Marchio said. ection since then. But in 2002 and 2004, he faced strong primary challenges from conservative candidates in his party. And in 2004, an underfunded Democratic candidate, Utica College Professor Jeff Miller, managed to win about a third of the vote with a campaign that raised less than $40,000. In the same election cycle, Boehlert’s campaign spent more than $1.5 million, according to the Center For Responsive Politics. Boehlert, chairman of the House Science Committee, has consistently raised more money than his opponents over the years. But money has not been pouring in at the usual rate this time. As of Sept. 30, Boehlert’s campaign had $166,220 on hand, according to the CFRP, which obtains its information from the Federal Elections Commission. Asked why Boehlert, who has three challengers registered with FEC and others professing interest in the race, has not been more aggressively raising money, Marchio said, "I think he’s been more focused on policy than politics." In about two weeks, the FEC will release figures on money raised in the last quarter of 2005. Marchio said these numbers "probably" will show Boehlert has raised less money at this stage of the 2006 election cycle than in recent elections. "What you have to remember is he’s shown he can raise the money when he needs to," Marchio said. But will he need to? Democrat Les Roberts of German, who announced his candidacy for 24th District seat a few weeks ago, said Friday that the smaller-than-usual size of Boehlert’s war chest does make it appear the incumbent is getting ready to retire. Also, although Boehlert has often voted with his party on budgets, alienating some liberal voters, he has also broken ranks on other issues, such as drilling for oil in Alaska, alienating some in House leadership, Roberts observed. With the House dominated by conservative Republicans, Roberts said, Boehlert may not be given another committee chairmanship when his tenure as Science Committee chairman expires this year. "That might be a reason to retire, too," he said. Miller, who said Friday that he will announce his election plans Monday, said he, too, thinks the incumbent is getting ready to retire. The first candidate to challenge Boehlert in this cycle was Republican Brad Jones, general manager of ITT Industries-Gould Pumps in Auburn and the former mayor of Seneca Falls. Jones, whose campaign has raised nearly $86,000 so far, said he has heard the rumors that Boehlert will step down. "It won’t really affect my campaign, because I’m running for the office no matter who else is running," Jones said. Jones said he has heard that state Sen. James Seward, R-Milford, and state Sen. Raymond Meier, R-Utica, are considering runs for the 24th congressional district seat. Duncan Davie, Seward’s spokesman, said Friday that Seward is not considering a run for Congress at present. "There is no vacancy in that district," Davie said. However, if Boehlert were to announce his pending retirement this spring, Seward might consider running, Davie said. In addition to Jones and Roberts, Oneida County District Attorney Michael Arcuri, a Democrat, has registered with the FEC. Other candidates who have expressed interest include Utica lawyer Leon Koziol and former Cortland Mayor Bruce Tytler, both Democrats. ALBANY, N.Y. - Democrat Eliot Spitzer, the leading candidate for governor, has chosen New York's top black legislator as his running mate, a person familiar with the decision said Monday. State Senate Democratic leader David Paterson, who is legally blind, is credited with narrowing his party's deficit in the Senate, controlled by Republicans since 1965. Paterson has agreed to run as lieutenant governor with Spitzer, according to the source, who would speak only on condition of anonymity because no official announcement is expected for a few days. Spitzer, the state's attorney general, is known for his crackdown on Wall Street abuses. A spokesman for Paterson, 51, had no immediate comment. A spokesman for the state Republican chairman didn't immediately respond to a request for comment. "He is a legitimate, intelligent and so far effective reformer," former Democratic Gov. Mario Cuomo said of Paterson. Paterson was elected in 1985 at age 31, representing a Manhattan district. He was elected minority leader in 2002 and addressed the Democratic National Convention in 2004. He has sought to open the budget process and change the workings of the Senate, which provides little power to the minority party. He lives in Harlem with his wife and two children. He is a graduate of Columbia University and Hofstra University Law School. His father, Basil Paterson, ran unsuccessfully for lieutenant governor in 1970 and later became New York secretary of state. In October, Basil Paterson endorsed another Democrat running for lieutenant governor, Leecia Eve, according to Eve's Web site. 1.) Hundreds possibly even thousands of American citizens may have been spied upon since Bush authorized domestic spy program. 2.) These powers to break the Federal Intelligence Surveillance Act (FISA) came with the Congressional approval for Military action in Afghanistan, and that spying is simply a incidental action of war. Put these two together and we can conclude the Bush administration has accepted the reality they are at war with American citizens. If spying is an act that can be done to enemies in at time of war, then spying on Americans is an act of civil war. JIM LEHRER: Well, as you know, Mr. Attorney General, many present and former leaders of the Congress at that time when that resolution was being negotiated after 9/11 said that never even came up. They didn't in any way suggest or mean to suggest that the president had the right to go around FISA to electronic surveil people. ALBERTO GONZALES: I would take you to the Supreme Court decision in Hamdi, the 2004 Supreme Court case. There, Mr. Hamdi contested the authority of the president to detain an American citizen in violation of an existing statute. We argued that the authorization to use military force constituted permission by the Congress to do so. The Supreme Court agreed. And the Supreme Court said it is of no moment that the authorization to use military force does not mention detention. Detention of people captured on the battlefield is a fundamental incident of waging war. The same is true with respect to electronic surveillance. An update about that Utica area NYS Senate seat mentioned recently. Apparently, Adirondack Bank president Tom Clark has put out feelers about the possibility of his running for the New York State Senate seat held by his fellow Republican Ray Meier, but only if Meier gives up the seat to run for the U.S. House seat currently represented by Sherwood Boehlert. Speculation is that Boehlert is considering retiring. If he does, Meier's made it know that he's interested in running. AN INFLUENTIAL GOP leader wants a prominent Republican Party consultant fired for allegedly working to help a Democrat defeat an upstate Republican congressman. The extraordinary demand was made over the weekend by Saratoga County GOP Chairman Jasper Nolan, a prominent upstate GOP leader. He says consultant Patrick McCarthy, a former executive director of the party and a close political ally of Gov. Pataki, is trying to undermine incumbent Rep. John Sweeney. Sweeney, a former GOP executive director, has been highly critical of Pataki's leadership. Sweeney, a Saratoga County resident and close political ally of Mayor Bloomberg and former Mayor Rudy Giuliani, has told friends he believes that Pataki himself approved of McCarthy's alleged efforts to help his Democratic opponent, Kirsten Gillibrand. Gillibrand is the daughter of Albany lawyer/lobbyist Doug Rutnik, a longtime fixture at the state GOP headquarters and the significant other of Zenia Mucha, the Walt Disney Company exec who was once one of Pataki's top political advisers. "Doug Rutnik's daughter is not going to challenge Sweeney without Pataki's OK," said one of the state's most prominent Republicans. Nolan made his demand over the weekend in a stinging letter to state GOP Chairman Stephen Minarik, a copy of which was obtained by The Post. "I am deeply concerned to learn a paid consultant for our party was recently spotted having dinner at an Albany restaurant with the announced 2006 Democratic opponent of Congressman John Sweeney," Nolan wrote. "This is an outrageous development, and I respectfully request that Mr. McCarthy be removed from the Republican Party payroll immediately. ". . . He should be replaced by someone who is committed to defeating Democrats and not to aiding and abetting those who seek to defeat incumbent Republicans like our congressman." McCarthy, who was once Pataki's chief patronage dispenser and is now a lobbyist with the politically wired Patricia Lynch Associates, is paid $25,000 a year as a part-time consultant to the state GOP. He told The Post that he'd merely had "a couple of sodas" with Rutnik and his daughter. "I have nothing to do with that effort at all," he insisted, saying that Rutnik was a longtime family friend and that the meeting was strictly social. But others familiar with the situation said they believe that McCarthy was an informal adviser to Democrat Gillibrand as part of Pataki's effort to retaliate against Sweeney, who has publicly blamed the governor for a long string of GOP defeats.